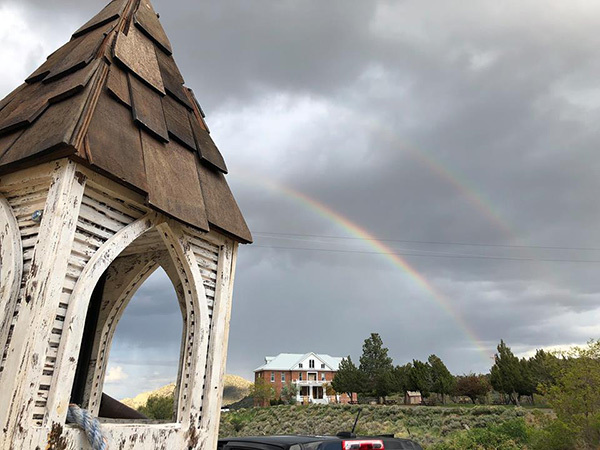 A rainbow greets the Upside Down Church as it arrives in Virginia City. Here is the church and here is the steeple. Open the door and see – Oh, sweet Mother Goose! – a heart-wrenching mess. 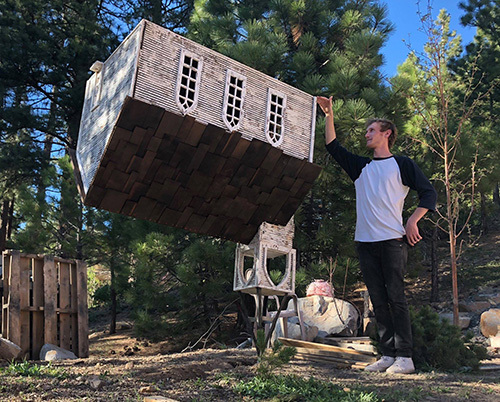 Inspired by a “very personal, visceral” church gathering with his family, artist Sam Shear revealed his sculpture, Upside Down Church, on Sunday, May 27, in Virginia City. After a presentation, Jenni Charles and Jesse Dunn of the Dead Winter Carpenters performed a gospel hour of songs. A Lake Tahoe resident, Shear owns Terrapin Ridge Productions and works with Devil Dog Productions, a major live music promoter in the area. He earned a degree at Sierra Nevada College, where he realized his passion for art and music. After a hiatus at his home-state Illinois, he moved back to Tahoe. Sunday’s event is part of Shear’s SNC master’s thesis in fine arts. He said his art’s subject matters are things that affect him, controversial topics within the realm of social, political and environmental issues. Nothing’s more controversial than religion or heartfelt than family. The concept of the Upside Down Church came to Shear at his grandmother’s funeral. Church steeples point heavenward on Midwestern skylines, but inside, familial demons dwell. The 1/20-scale replica of a Midwest style church, with its steeple planted in the earth, sits across the street from the St. Mary’s Art Center. Shear said it’s an appropriate site to be in Virginia City, with its historic buildings and hillsides scarred by mining in the 1800s. 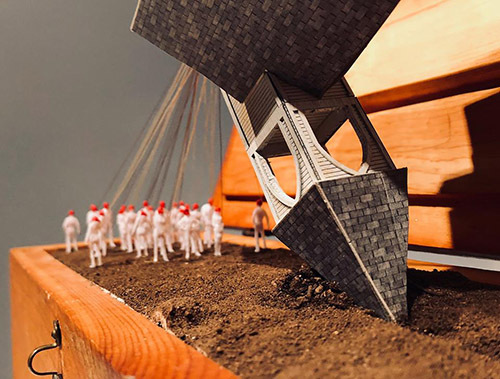 “Like a ship on the water, where a ship leaves a wake behind it, the Upside Down Church, where the steeple meets the ground, leaves this deep trench,” Shear said. “The trench is a metaphor for the issues we have and the aftermath left behind.